I have been working on Sunny this past weekend. 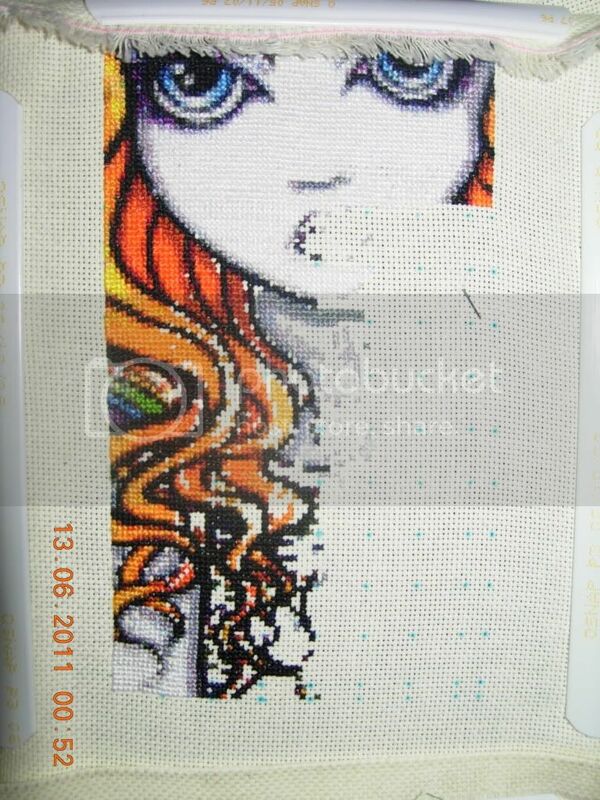 She is so bright and colorful to work on that its so much fun to stitch her! Although she is full of confetti! You wouldn't think it to look at her but she is! Her mouth is starting to take shape. And her hair is almost done, on this side of the page anyway. I still have the other side to do. I did it this way because with all the confetti involved it was getting too tight to stitch towards the end of the page, so I am working a half page at a time. I see alot of confetti in my future with her shirt! Also this weekend I had the wonderful pleasure of introducing my 5 year old daughter to the world of cross stitching!!! She had always been interested in watching me, and recently expressed an interest in wanting to do it herself. So I decided to teach her! 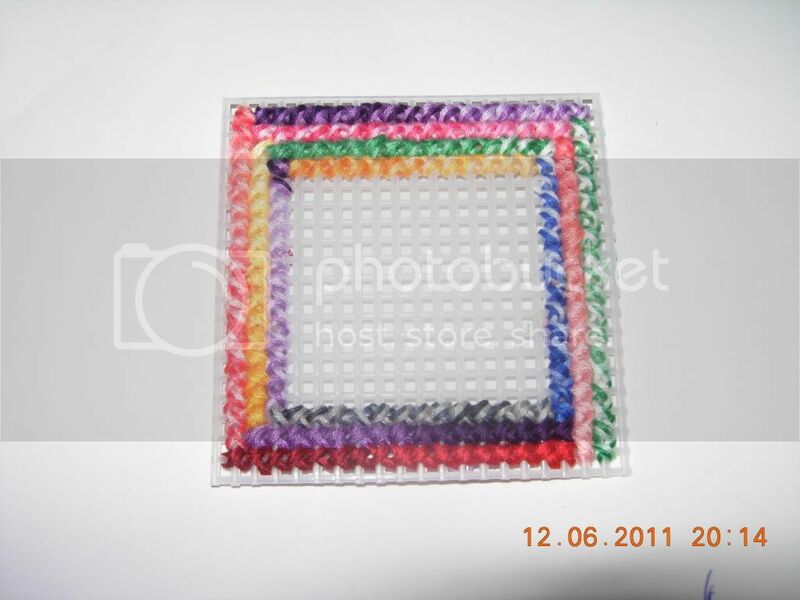 I decided to get some plastic canvas for her and I cut it into 6 squares which we will later stitch together to make a box. She picked out her own variegated ﻿thread and decided where to put each color. At first I had trouble making her understand the concept of making the cross. She didn't understand the word diagonal. So I finally tried to show her where the "box" was that she was stitching and assigned numbers to the four corners. And told her to come up in which number were to come down. She was concentrating very hard. ﻿I am very proud of my baby! Your DD is doing a great stitching work! I like a lot the colors she picked, they are very cheerful!!! Sure you are proud! Waht a great pleasure it must be, to teach your daughter makes cross-stitches. And the face of your Sunny is great! Sunny looks amazing and the stitching your daughter did is fantastic. I hope that one day I will have children who like to stitch, too. Sunny has beautiful colors, she looks very lovely ! !Your daughter is very clever and of course you're proud, quite rightly! Your daughter is doing wonderfully! 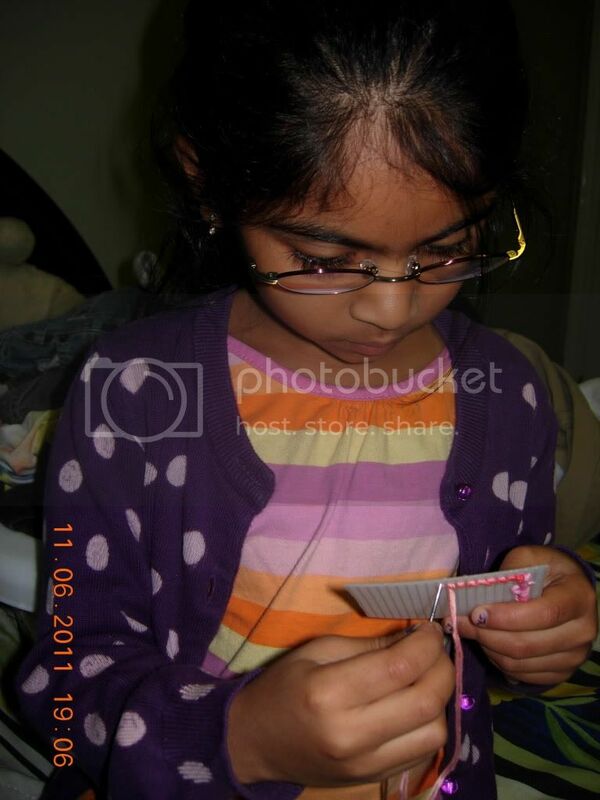 I have a 5 year old little girl who, for the moment, is content just watching mommy stitch. I'm hopeful that she'll eventually want to take up the hobby herself, but I wasn't sure how to get her started. 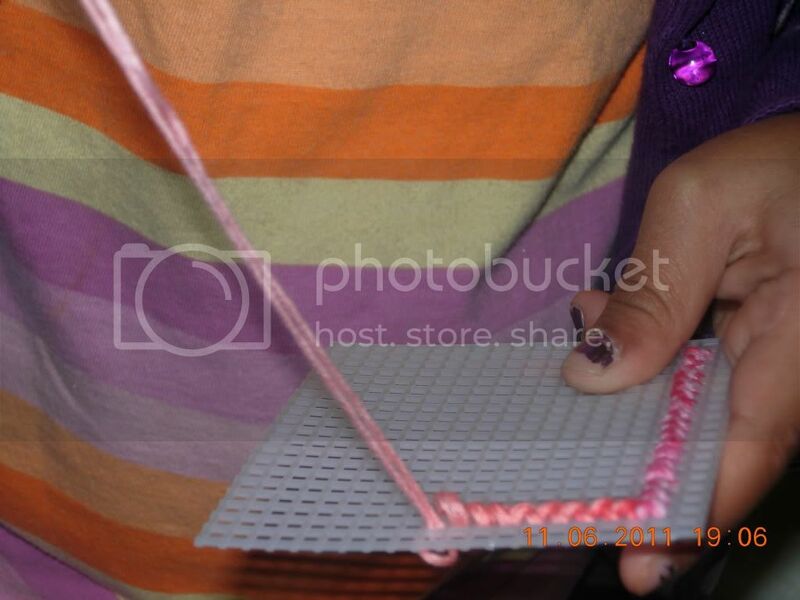 The idea of the plastic canvas sounds perfect for little hands! Thanks so much for posting this up! What beautiful stitching from your DD. She must be very proud of how well she has done! Woo great stitching by your daughter - I'll bet she has her own HAED wish list before you know it!! That's wonderful Vani. I'm so glad she's interested in learning. I would love to have someone to teach!!! Sunny looks great. Of course there's a lot of confetti, it's an HAED, lol. Keep up the good work!